So click on Google's "holiday logo" and you'll get the script on the top and the bottom. Because I guess Christmas for Google is now the new C-word. You better remember that. It may be on one of their vaunted exams that gets you employed. But Sergey and Larry forgot about the original Google tip! 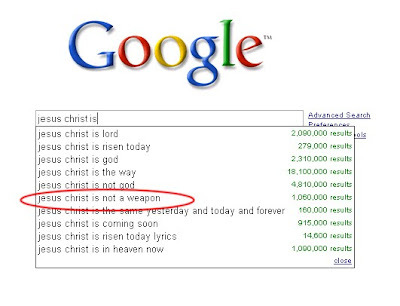 But then again, maybe Google thinks He is a weapon, and not just the way! Despite what their search algorithms say! No weapon that is formed against thee shall prosper; and every tongue that shall rise against thee in judgment thou shalt condemn.